For those of you who have been reading my blog for a while - you know that 2011 was a crazy year for me, running-wise. I started off the year with the Disney Marathon (my first! 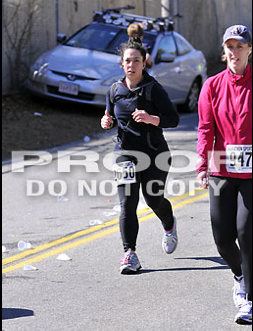 ), the Hyannis half in February (my seventh! ), and then Reach the Beach in May. This was all before an injury that sidelined me from running, and most activity, for almost four months. After finishing physical therapy (twice) I decided that my comeback race would be the Hyannis half. I had fun last year, the course was pleasant (despite the cold and snow), and I'd have many friends down there who were also running the race. I signed up - hoping that the race would spark something in me and I'd get excited to run again. But, if we're being honest here, training was a struggle. Between indoor rock climbing, fighter fitness and general malaise - most weeks I was only able to get in a couple of runs. Although some weeks I did manage to squeeze in the three that were on my schedule. I did very little speed work and whenever asked about my time goal for the race, my response was always "survival". I can't tell you how many times I reminded myself that the point of this was to just get back out there, to prove that I could still run a half marathon. I told my friends that I was having an attack and Juls shot off to find my inhaler. I felt so much better after the inhaler and some water and I looked down at my watch to see my time: 2:21:30. Not my best race by a long shot, but somehow, even in the midst of an asthma attack, I was able to run my second fastest half marathon. I'm still really, really slow, I totally get it. But I still feel like a total rockstar that I was able to keep myself together despite everything that was going on. Oh, and for the record - half marathon #9 will be happening on March 25th. Is anyone running Eastern States (the half or the 20 miler?) - if so, let me know, I'd love to meet up! Also, I've started using my inhaler 30 minutes before running and haven't had another attack since!